Since 1977, the Academy of Sanskrit Research, Melukote, has been the torch bearer of our vast and rich Sanskrit cultural heritage, especially in the sphere of Visistadvaita philosophy of Sri Ramanujacarya. The Academy has brought out many of the old Sanskrit works into the public domain that have made easy to read, understand and contemplate. Nyayaleelavathi is the work of Shri Vallabhacharya who belonged to eleventh century. 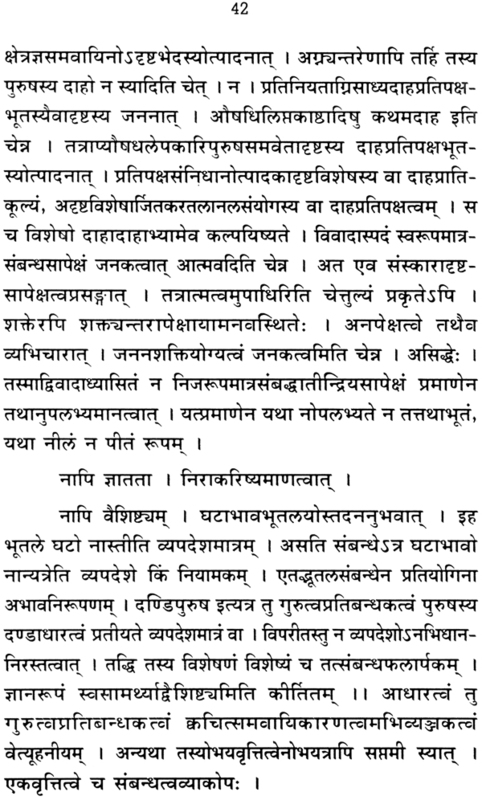 The book has beautifully explained Dravya, Guna, Karma, Samanya, Visesa and Samavaya. These six are the categories of substance in Vaisheshika Darshana. As this book is a major work on the science of logic and understanding it is a mark of high intellectuality. Mukura means Mirror. The way the mirror reflects the charm of Leelavathi's face, the intellectual charm of the readers of this book is also reflected in the same way. This book emphasizes the expositional expertise of Mahamahopadhyaya Vid. N .S. Ramabhadracharya. The Nyaya Leelavathimukhamukurah is formed only for Uddeshaprakarana. 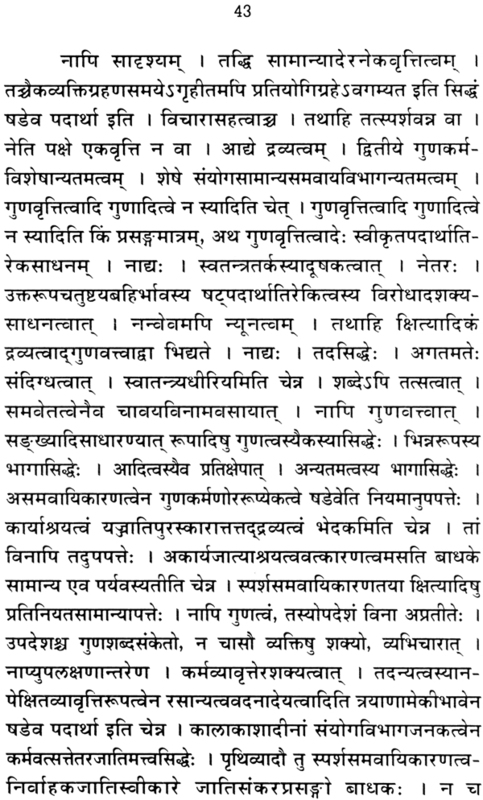 Therefore we are publishing in this edition particularly this prakarana only. The explanations are simple and comprehensive. The book itself is like a beautiful mirror. This book can also be considered and used as an independent work. If the book was a complete one, it would have become a master piece in the history of the science of logic and law. 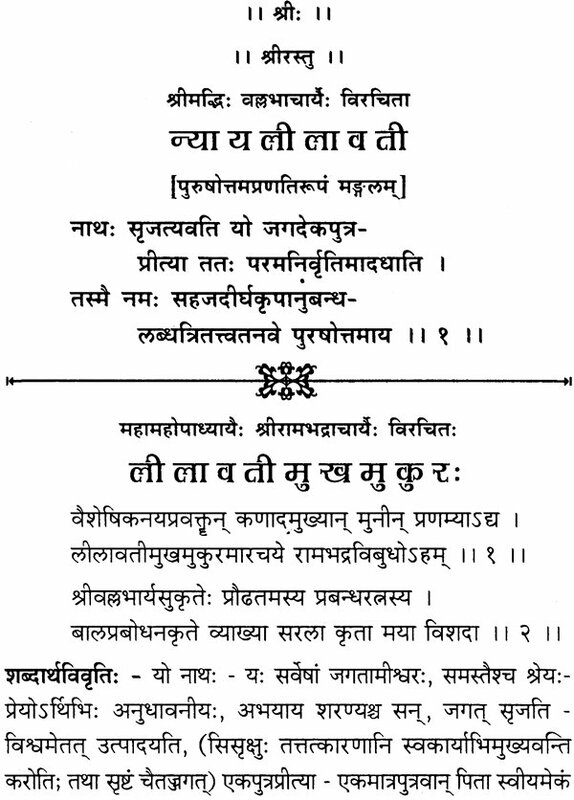 Mahamahopadhyaya Vid. N .S. Ramabhadracharya was born in Nuggehalli of Chennarayapatna and belonged to the family of Kratunatha. He was a-simple man with serious outlook. 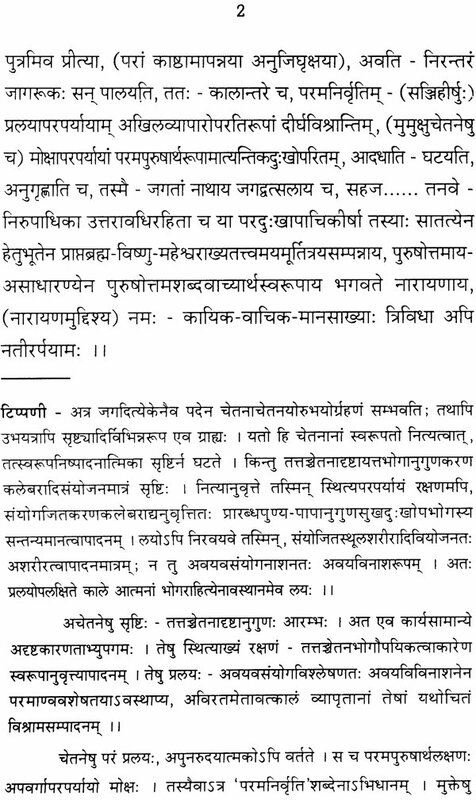 In his childhood itself he had studied Krishna Yajurveda in depth. Later, he studied Grammar, Law, Poetic Ornamentation, Vedanta completely and was blessed by Shri Rangamahaguru. He served for 30 years as a Professor of Nave en a Nyaya at Sriman Maharaja Sanskrit College in Mysore. Later he served the Academy of Sanskrit Research in Melkote and was responsible to bring out many works into publication. Apart from these contributions, he has written many works in his leisure time and the most important among them are Nyayadarshanabhumika and Nyaya Leelavathimukhamukurah. While involving himself in the critical reviews of the books related to Shri Bhashya, he has also authored more than hundred Kannada-Sanskrit essays. He is honoured as "Mahamahopadhyaya" The Academy of Sanskrit Research awarded him the title of "Jnana-Nidhi" in 2008 for his invaluable contributions to the Academy. Vid. Shri Umakanthabhatta, Professor, Govt. Sanskrit College, Melkote who is a multi-talented personality, is the student of Mahamahopadhyaya Vid. N.S. Ramabhadracharya. He is the idea and inspiration behind Mahamahopadhyaya Vid. N .S. Ramabhadracharya to bring out Nyayaleelavathi- Mukhamukura. Vid. Shri Umakanthabhatta has studied M.A. in English, in Ancient and Modern Law i.e., Pracheena & Naveena Nyaya Vidwat and is presently serving as a Professor at Govt. Sanskrit College in Melkote. 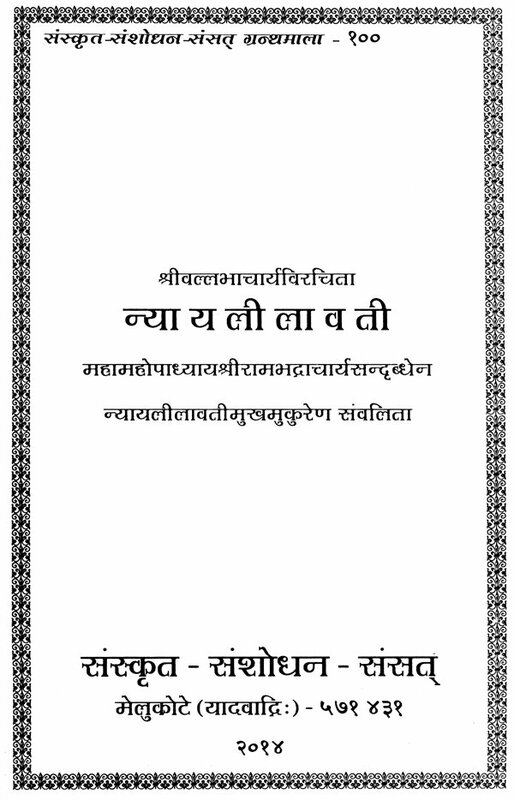 It is a matter of great honour and respect to the Academy of Sanskrit Research that it is publishing the Nyaya Leelavathimukhamukura work of Mahamahopadhyaya Vid. N.S. Ramabhadracharya. Shri Bhashya edition is a model for critical analysis of an ancient work & Nyayaleelavathi- Mukhamukura is the model analyzing the science of law. Further, we are grateful to Vid. Umakanth Bhat, Melkote and Vid. S. Narayana, Research Officer (Retd.,), Academy of Sanskrit Research, Melkote for his support to bring out this valuable edition.